Background: In April 2015, the US Food and Drug Administration approved the first generic glatiramer acetate, Glatopa® (M356), as fully substitutable for Copaxone® 20 mg/mL for relapsing forms of multiple sclerosis (MS). This approval was accomplished through an Abbreviated New Drug Application that demonstrated equivalence to Copaxone. Method: This article will provide an overview of the methods used to establish the biological and immunological equivalence of the two glatiramer acetate products, including methods evaluating antigenpresenting cell (APC) biology, T-cell biology, and other immunomodulatory effects. Results: In vitro and in vivo experiments from multiple redundant orthogonal assays within four biological processes (aggregate biology, APC biology, T-cell biology, and B-cell biology) modulated by glatiramer acetate in MS established the biological and immunological equivalence of Glatopa and Copaxone and are described. 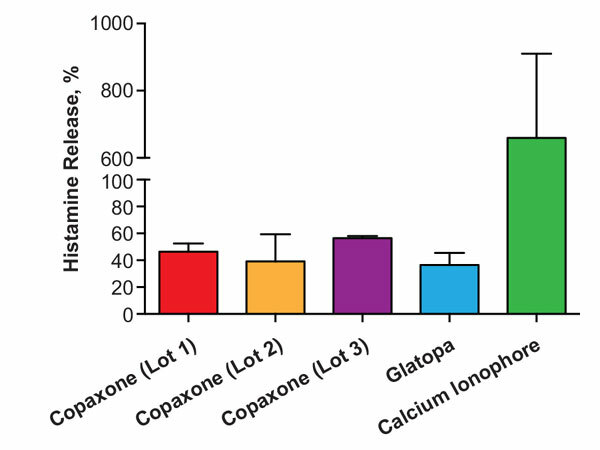 The following were observed when comparing Glatopa and Copaxone in these experiments: equivalent delays in symptom onset and reductions in “disease” intensity in experimental autoimmune encephalomyelitis; equivalent dose-dependent increases in Glatopa- and Copaxone- induced monokine-induced interferon-gamma release from THP-1 cells; a shift to a T helper 2 phenotype resulting in the secretion of interleukin (IL)-4 and downregulation of IL-17 release; no differences in immunogenicity and the presence of equivalent “immunofingerprints” between both versions of glatiramer acetate; and no stimulation of histamine release with either glatiramer acetate in basophilic leukemia 2H3 cell lines. Conclusion: In summary, this comprehensive approach across different biological and immunological pathways modulated by glatiramer acetate consistently supported the biological and immunological equivalence of Glatopa and Copaxone. Antigen-presenting cell, B cell, glatiramer acetate, generic, multiple sclerosis, T cell.